U.S.S. Enterprise, N.C.C. 1701, Somebody's gotta do it!! I have begun on a venture to boldly go where no man has gone before!! An EDF Starship Enterprise!! My old roommate was a huge Trekkie, and he gave me a plastic model of the Enterprise. Well, I got to looking at it the other day, and to my amazement, the three view drawings were all the same size!! So, out comes the projector and my drawing board propped up against the wall, and three view outlines have been created. I will start drawing parts from them tonight, and figure out the logistics of how it is going to be assembled, and more importantly, disassembled. I sized the drawings for a twin 80mm EDF set-up in the engine nacelles, which puts the overall length at just under 6 feet, with the dish measuring almost 32 inches across. I plan on utilizing a V tail set up, with control surfaces on the engine nacelle booms for rudder/elevator control. I may add an additional rudder on the rear of the main dish boom if it becomes necessary. I am thinking I will go with a twin independent 6S setup as it is on the Tomcat and Warthog. 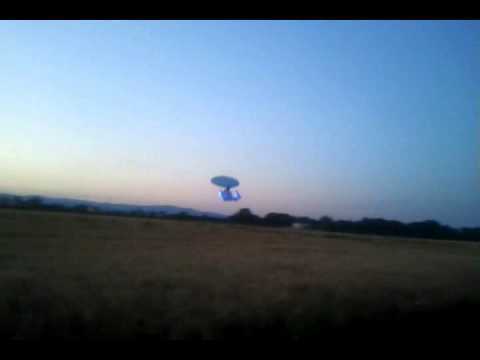 I will post pics as she starts to come together, and carry on all the way to the ultimate end, the maiden flight!! I am thinking I am going to produce a flat foamie first to gauge viability and figure out where the CG needs to be, so, until next time...Live long and Prosper!!!! Interesting project with EDFs. You've seen the prop version? That is pretty neat, I hope my EDF version flies that well!! It seems like the 1701-D would be suited much better to an RC model, but I am going to carry on with the version I have, and see what shakes loose!! Just be careful on the CG! I believe the flat foamies I have seen needed the CG at roughly 1/3 chord of the saucer! I would also advise making the pylons a bit wider to give some more vertical stabilizer area. And personally, I would ditch the metal housing fans and go for a lightweight plastic unit like the FMS or changesun. That tail weight is going to be hard to balance even with 8000 mah 6S or so up in the nose. Thanks for the info DeltaDart!! I was planning to start at 2/3rds of the saucer, I guess I need to move that up a LOT!! I will also take the housing advice under advisement. 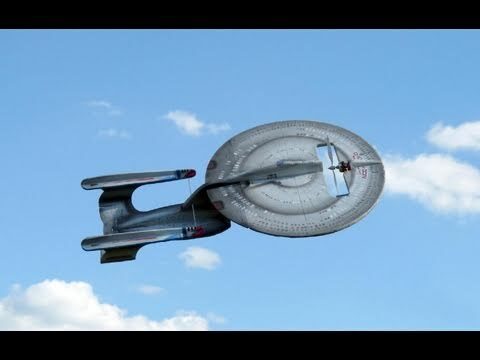 The length of the nacelles(33 inches) is such that I am afraid that I am going to lose a lot of thrust if I mount the fans all the way forward in them(which would be optimal for balancing) so I am thinking they need to be back around where the booms contact the nacelles. Anyway, gonna be a lot of trial and error getting this thing to fly right, so strap in, set your phasers to stun, and enjoy the bumpy ride....Warp speed Mr. Sulu!!! Don't you mean "set phasers to FUN"? I'm looking forward to seeing this progress. Definitely interested in following the progress of this. I have always wondered if it could be done well. Your'e off to a good start. Control of the back end of it could be tricky. I wonder if you could utilize thrust vectoring to any benefit or maybe one larger fan in the main body? Would get the weight forward for sure and still keep your thrust tube short. Just a thought. That was a consideration as well. I thought about putting two 70mm fans in the nacelles, and one 90mm in the main body. If I wind up doing this, the 90mm will be 8S, and the twin 70s will share one 6S. I ran into a honey do list last night, so I didn't get too much done. I got the center lines drawn, and the template for the saucer ribs made. I think I am going to use a light cardboard tube, cut to length in the center and make 8 "ribs" to comprise the structure out to the edge. I will then use webbing in between them for rigidity. I will create a slot for the key that I will make into the top of the main boom out of 1/8" lite ply so that it will slide in to the saucer section and either be glued or secured with screws. Then, create a battery compartment in the forward saucer section, and a chase for the leads. It will then get sheeted with 3/16" DTFB with the paper removed. I am hoping to have this much complete by the end of the weekend, so there should be lots of pics to share on Monday. That was a consideration as well. I thought about putting two 70mm fans in the nacelles, and one 90mm in the main body. Wow! You could possibly hit warp factor 11 if you went that route. Damn it Jim, I'm giving her all she's got!! Kloverzero. Dang man when you get ready tp maiden this one let me know and ill drive down from Fayetteville to witness this one. Progress was slow this weekend. Flew all day Sunday, came home pretty sore, but I am not complaining. I also took possession of an E-Flite Convergence and I can not seem to put the thing down!! I went to Office Depot on Friday night to find a tube so that I could begin construction of the saucer, and what do you know...my 70mm Dr Mad Thrust fans fit right in them!! Now I can just make the shape around them, and I have a rigid duct, that weighs almost nothing, and still have enough left from the cut-off to make the saucer!! Win-Win!! So, I will get to work tonight and get the saucer fleshed out, and have some more to share tomorrow, if I can leave that damn Convergence alone!! The maiden may not be a very spectacular affair!! I think I would wait for the second or third flight!! The maiden could well be very short! !